I'm leaving for my parents' house in a few hours and will be back on January 2nd. So, my Christmas project was successfully completed. A home-made Christmas tree, a small wreath (under the candle), and a fruitcake with icing. This year I gave up on making some of my staples such as matcha cookies, jam thumbprints and big, soft ginger cookies. Other than the gingerbread people decorating the fake tree, I baked only two kinds of cookies: lemon sable and snickerdoodles (with my own tweaks. I turned them into orange snickerdoodles.). And my crazy invention, rum-amaretto fruitcake. The icing of the cake consisted of almond paste and royal icing. How about that? I liked this cake alright, but it could have been better, to be honest. I should have used more dried fruit. Now I'm relaxing in my room, enjoying food and drink. So much has been happening lately and I have to take care of so many things. But for now, I don't want to do anything else but to enjoy this peaceful moment alone. Let me thank you for all your support throughout the year. I had to go through a lot in 2007... a surgery, changing jobs and all ... I couldn't have survived without your warm comments and emails. love, happiness and special memories. You ought to see this! Click on this link and see how much we raised so far. It already surpassed last year's record: $60,925.12, and now it's over $80,000 !!! I'm really excited. Are you? If you didn't know about this campaign, don't worry. It's still not too late. Looks like bids are accepted through this weekend. (Right, Pim?) * Go to Chez Pim to find out how many hours are left to bid! Don't forget to check out the photos from Lesotho, Africa posted on her site. The fund raised by this campaign will be used to support the school lunch program there. The photos will give you some idea of what kind of place it is. The bento shop that I have been working at is going to close on January 15th. What an exciting news to hear right before Christmas. To be perfectly honest, we (employees) all knew that this was coming. We just didn't know exactly when. And that was why I was reluctant to start "Bento shop chronicle" series on this blog (though I had promised to do so), because it would have been too short and depressive... like, "I started working at a bento shop. I drew hundreds of bento illustrations to memorize how to pack different bentos. And the shop closed." That's it. What a joke. Oh well. Let's hope that 2008 brings a better luck. See? The baking fairy in me is whipping me to work hard. I know. I have no creativity. I just stole the decoration ideas from the photos on photostock and allrecipes. ... pretty OK, I think? Now the cake is "aging" in my fridge. For the Christmas of 2007, I don't think I can prepare a big dinner like I did in previous years. The reason is: No time and no money. I'm going to help dad with picking oranges on the 23rd and 24th, so there is no way I can fix a special meal in my apartment on the Christmas eve or Christmas day. Instead, my Christmas project this year will consist of a) a homemade(?) Christmas tree decorated with gingerbread people, b) a fruitcake with tons of icing, and c) a tiny homemade wreath. It would be wonderful if these would be accompanied by a bottle of decent sparkling wine and a good-looking candle. I'm extremely busy these days, but determined to make a small Christmas tree (decorated with gingerbread people) and a wreath. And this coming Sunday will be Christmas baking day. Ahhhh... I need 36 hours in a day! 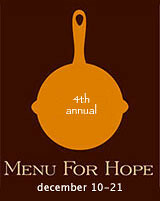 Menu for Hope is an annual, worldwide campaign by foodbloggers and this is its fourth year. It is an online raffle which gives you a chance to win one of the great prizes donated by foodbloggers all over the world. And by buying the virtual raffle tickets, you make a contribution to the effort to make this world a better place, because the money raised will be used to support the UN World Food Program (more specifically, the school lunch program in Lesotho, Africa this year). For more details about the Menu for Hope campaign, visit Chez Pim, and check out the full round-up of prizes worldwide! (Isn't the list amazing?!!) Also, take a look at the regional round-up on Grab Your Fork by Helen, the regional host of the Asia-Pacific region. 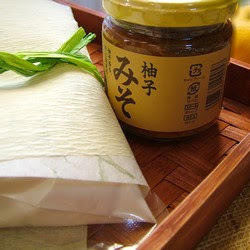 Yuzu miso is an excellent marinating paste for fish and meat, and it also makes great dressing for tofu or vegetables. Yuzu kosho is also a versatile and flavorful condiment that is widely used not only for typical Japanese dishes like nabe, yakitori, etc. but also for various dressings and pasta dishes these days. You want to be part of the fun? 3. For US donors, if your company has agreed to match your charity donation, please remember to tick the box and fill in the information so we may claim the corporate match. 4. Please make sure you tick the box to allow us to see your email address so we may contact you if you win. Your email address will not be shared with anyone. 5. Winners will be announced on Chez Pim in mid-January 2008. The campaign runs from December 10th to 21st. And I'll keep updating this post during this campaig with additional info. on my prize and/or more photos, so check back on this entry if you are interested. Pound the pork slices to make them thin and tender. Season with salt and pepper (both sides). Spread yuzu miso on one slice and place shiso leaves on top. Spread a little yuzu miso on them and place another pork slice on top. Thoroughly coat the surface with flour and shake off the excess. Dip in beaten egg, then coat with bread crumbs. Deep-fry in vegetable oil until golden brown. * If the sliced pork is thick, I don't recommend sandwiching the miso and shiso with two slices, because it would take too long to be done. Sprinkle cod fillets with salt (and sake). Leave for apx. 5 minutes. Slather yuzu miso on top and grill until the salmon is done. Instruction is basically the same as grilled cod. Sprinkle salmon fillets with salt (and sake). Leave for apx. 5 minutes. Slather yuzu miso on top and grill until the salmon is done. Season oysters with salt and pepper (and sake). Put them in oyster shells, if available. If not, mini casserole dish or baking dish will do. Top the oysters with yuzu miso. Bake in the oven just until the oysters are done. (About 5 minutes at 450 F?? Do not overbake!) Sprinkle minced green onion on top to serve. For an oden recipe, click here. For the instruction of making furofuki daikon, see this post. You might be tempted to add seasonings like a pinch salt or one teasp. light soy sauce or instant dashi powder to simmer daikon, but just do not add too much seasoning. And NEVER let daikon turn brown with soy sauce. Serve with Yuzu miso on top. Divide cooked white rice in two. -- Mix soy sauce and sake. Add to cooked rice with sesame seeds and mix. Shape into a triangle. Grill both sides (top and bottom). Spread yuzu miso on top. Grill the top a little more to slightly burn the miso. -- Add green laver, sesame seeds and slat to rice and mix. Shape into a triangle. Grill both sides (top and bottom). Spread yuzu miso on top. Grill the top a little more to slightly burn the miso. I first made yaki onigiri with plain rice and yuzu miso only. The miso-covered top was really tasty, but the rest of the onigiri tasted rather bland. So on my second try, I seasoned the rice with above-mentioned ingredients, and it worked well. Some people put fillings in yaki onigiri, but my hunch is that a filling with a strong taste -- like umeboshi -- would probably ruin the taste/flavor of this yuzu miso. So today I tried out one of the yuzu kosho pasta recipes that I found on the net. Well, to be more precise, I combined two different recipes ('chicken and lettuce pasta with yuzu kosho' and 'Tuna cream yuzu kosho pasta') and added my own twist, too. Let me call this "chicken and lettuce cream pasta with yuzu kosho." Long name, ha? The ingredients were: chicken, lettuce, spaghetti, garlic, olive oil, heavy cream, salt, pepper and yuzu kosho. And it went so well with sparkling rose wine. It was so darn cold here today. I bet more than 90% of Japanese had nabe dinner tonight. This green stuff right next to the grated daikon radish is not wasabi. It is yuzu kosho, green chili paste flavored with yuzu zest. This condiment was not so popular 5 years ago, but thanks to a popular TV cooking show, it has become popular throughout Japan recently. I did send out English translations or URLs of the recipes (or related info.) for persimmon jam, langue de chat cookies, pumpkin cookies, hanami dango, rakugan (Japanese dry sweets), sweet potato apple pie, frozen persimmon and slow cooker recipes written in Japanese. If you haven't received my email yet, please let me know, because I can send it again from a different email account in case my hotmail account was the problem. Now it's that time of the year again. Yep, time to soak dried fruit. For what? For whatever reason, amaretto was on sale at the liquor section of the supermarket I regularly shop at. I was familiar with the name, and had read somewhere that it is used for cakes, but never actually tried it. Wanting something "different" for the fruitcake this year, I bought a small bottle of the almond based liqueur. When I opened the bottle, heavenly aroma came out, which somehow reminded me of something very familiar. "AH! 杏仁豆腐(Chinese almond jelly)!" I thought. Yes, nice aroma. But for my fruitcake, I wanted a kick of something stronger, like rum. Oh, I found out that the language school I work for does not have a Christmas event. I'll have no chance to share my gingerbread fun with kids. Oh well... I'll make gingerbread people anyway for my own pleasure. My colleague gave me some shishito yesterday and I tried out a "shishito and shirasu (dried baby sardine) pasta" recipe. Very simple seasoning -- garlic, olive oil, red pepper and salt -- but surprisingly tasty. I enjoyed it with yuzu chu-hai and 'cheese on baguette' (?). Mmmm.... should I categorize this under "Japanese" or "Western-inspired?"